One of the ultimate rewards when you're blogging is meeting your bloggy friends in person and breaking through that virtual barriers to create a relationship that goes beyond blogposts and tweets! 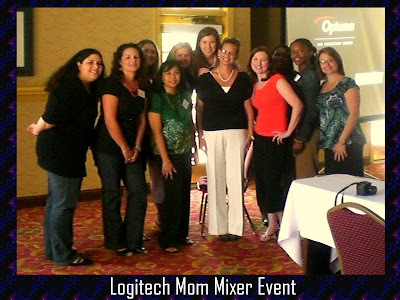 This is what I was privileged to experience when I was invited to participate in the recent Logitech Mom Mixer event in Cary NC. I was quite happy to be in this mixer and got the chance to finally meet these wonderful, influential ladies who most of them I only talk to and see online. I was specially privileged to meet the driving force behind Mom Select : Maria Bailey! A very influential lady yet so down to earth. Alongside her is the classy and very eloquent speaker Molly Gold of Go Mom Inc. whose tips and advices were so right on target for the multi-tasking, blogging aficionados moms of today! And then of course the highlight of the day was the chance to sample, test run and bring home Logitech's Webcam Pro 9000 and Vid Software loaded with cool techno features! I'm a big fan of Carl Zeiss lens technology and this webcam have it. "It got me with the lens!" Looking back at the course of my blogging career, I am really pleased to have finally decided to get out of my 14 inch widescreen box and get out into the world and socialized vertically! This event was my first mom mixer gig and it was a very wonderful experience. I've always looked forward to attending Blogher, Type-A Mom, Blogalicious, Blissdom and all the other mom conferences out there but as always, the nagging question is: when can I afford them? I'm keeping my hopes high. Now if you're a company looking to expand your horizon in the mom-o-sphere and reading this, I'm here! Bet your bottom dollar on me! The best perks you get out of events like these are not just the free stuffs or opportunities connected to it, but the chance to build offline relationships and rewarding friendships! I'm truly happy with the ones I made at the Logitech event! "You can bet your bottom dollar on it!" That's wonderful. Its always good to be able to socialize offline with those that you spend a lot of time socializing with online. Glad you got the opportunity. Oh, it was so great to meet you!! What a fun event and awesome webcam, too! I heart this post. I agree so much with your last paragraph. We did have a great day and so happy we have got to form a forever lasting friendship! Absolutely! It was a real treat to meet you and have that day together - all of us. This is a great post! And the webcam rocks! Thanks for sharing!